This will be a stretch for some of you dyed in the wool red, pink, and white valentine people, but for a heart collector I like to go outside the box. 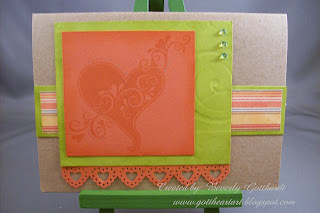 Supplies: Kraft Card Blank 4" X 5 1/2" Paper Reflections, Paper: I know the orange and green are Stampin Up but not sure which colors, the stripe from my stash, Stamp: CTMH-D1309 Heartthrob, Ink: Stampin Up-Tangerine Tango, Kiwi Kiss, Martha Stewart-Heart border punch, rhinestone stickers, Sakura Gelly Roll pen-Clear Star. I like the way you used these colours... Thanks for sharing! and playing at Easy Breezy. Hope to see you again in 2010.